Finally, I was back in California. The conferences were finished and I only had a few days left before heading back to Belgium. After not doing any mountains while in Oregon, I was really looking forward to spending one or two days in the Sierra. Big John had also expressed an interest and therefore we agreed on doing something in the Sonora Pass area. Catherine also wanted to come along, which would make the whole trip even nice. John picked us up at Lisa's house at 6 in the morning and after about 4 hours we got to the trailhead at the pass. I had looked at a couple of other SPS peaks in the area, notably Disaster and Black Hawk mountain, neither of which I had done before. However, a trip to either one would have turned into a major undertaking, using up most of the day. Since we were already fairly late at 10am, Leavitt Peak seemed to be the better choice. According to the maps, it is only a 6-7 miles round trip with about 1800 feet in elevation gain. So, we set off. The trail was a bit unfortunately done as it began with a big loop that added almost 1 mile to the trip. This excursion could have been avoided if we would have just gone up the clearly visiible use trail up the ridge. Acutally, on our way back we took that short cut and gained at least half an hour. John had taken his GPS and kept track of progress. According to its measurements we needed about 5 miles and 3 hours to get to the top of Leavitt Peak. Catherine was not feeling well at all, and therefore quite the hike a few hundred feet below the summit. She decided to just lay in the sun and wait for our return. 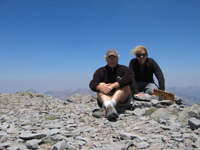 John and I arrived on the summit plateau soon after leaving Catherine and quickly signed the registry. The visisbility on the summit was rather bad. A forest fire somewhere in the vicinity produced lots of smoke, which impeded the nice views (although we could not see any obvious source of a fire). We could make out Highland and Silver Peaks, as well as Sonora Peak and Stanislaus Peak on the othe side of highway 108. John also pointed out Tower Peak to the south, an area that he had just checked out a few weeks earlier. While at the summit, Jamsheed from Palo Alto also arrived at the summit and had his picture taken their by proof. He had not originally planned to climb to the summit, but after chatting with us earlier had decided to follow us. I left the summit before John and Jamsheed, because I wanted to check up on Catherine. She was a bit dizzy and could hardly walk. Unfortunately, the hike back also inluded a couple of minor inclining sections and Catherine was in no shape anymore to hike up those. Therefore, John and I had to carry her for those passages. She is skinny woman, but carrying someone at 11,500 feet up the hill was still a bit strenuous and I was glad when we reached 10,300 feet at which point she was able to walk on her own, because it was only going downhill. We got back to the car at about 4:30 and still had enough time left to check out the Tower Peak TH and visit the Buckeye Hotsprings (just me), before going to Bridgeport for dinner. We ate at the Sportmen's Inn and found it to produce great burgers (pretty much the only item on the menu, hence a very specialized plate and therefore very good at it). Catherine and John headed back to Davis at about 7, merely 30 minutes before Rich showed up and we continued driving down to Bishop. I had reserved a room at the Vagabound Inn in order to be well rested before Sunday's hike up Middle Palisade. It felt great to be back in the Sierra Nevada. Everything felt so familiar. The weather was nice and I was full of anticipation for the next day's hike. Another 14er was waiting, it would be my 9th. Very exciting. I also had never been to the Glacier Lodge TH before, which was another exciting aspect of the trip. Nevertheless, I went to bed at 10pm and slept soundly until the alarm went of at 4:20.